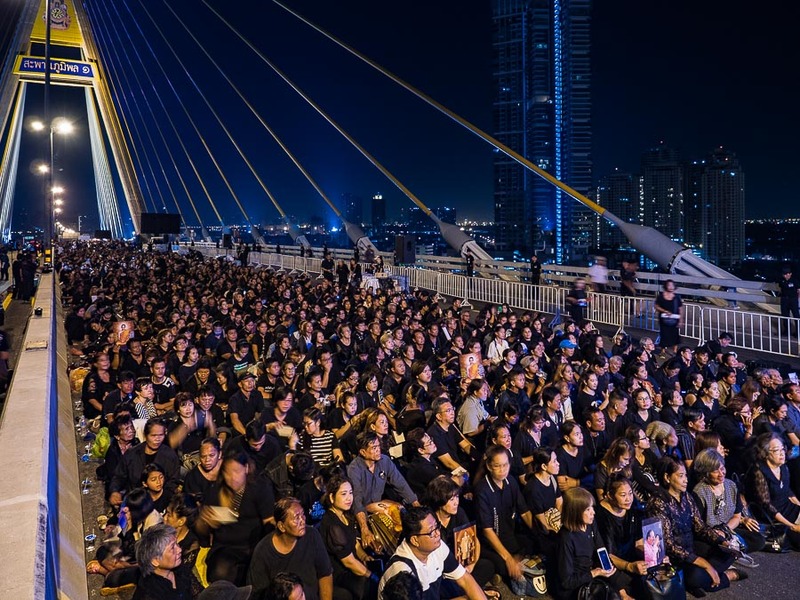 A woman holds up a portrait Bhumibol Adulyadej, the Late King of Thailand, during a ceremony to honor His Majesty on Bhumibol Bridge (named after the King) in Bangkok. December 5 is the birthday of Bhumibol Adulyadej, the Late King of Thailand, who died on October 13 after a long illness. This year would have been his 89th birthday. The King was revered throughout Thailand. 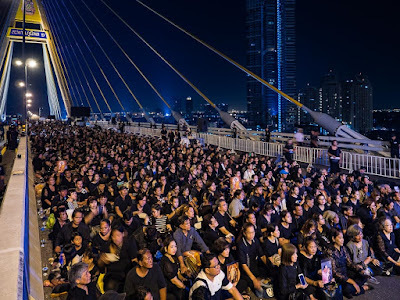 People of all political persuasions, bitter rivals in their political lives agreed on one thing - the central role of the King in Thailand. Tens of thousands of people gathered on the bridge to honor the King. I've made it a point to photograph the King's Birthday every year we've been here, starting in 2012. (I even photographed his birthday in 1992, during a vacation visit to Thailand.) This year was obviously much different. 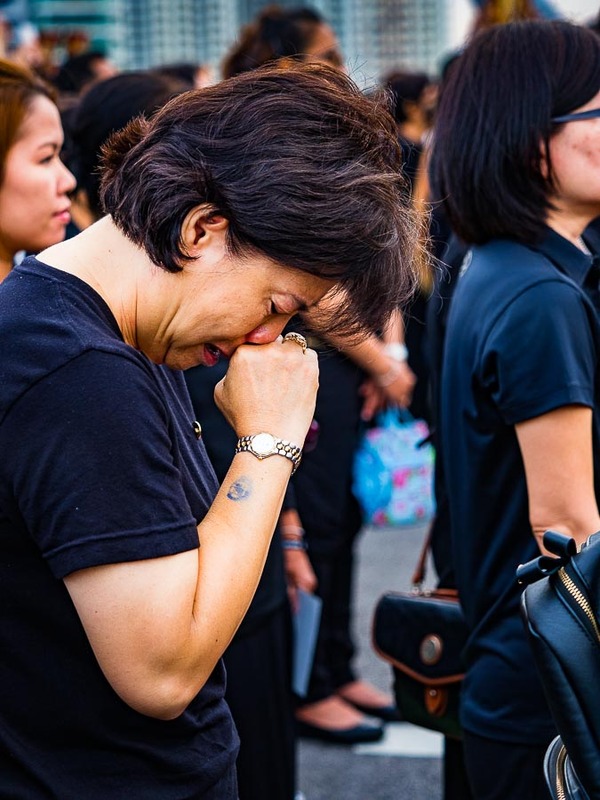 Thais have been grieving His Majesty's death for six weeks. 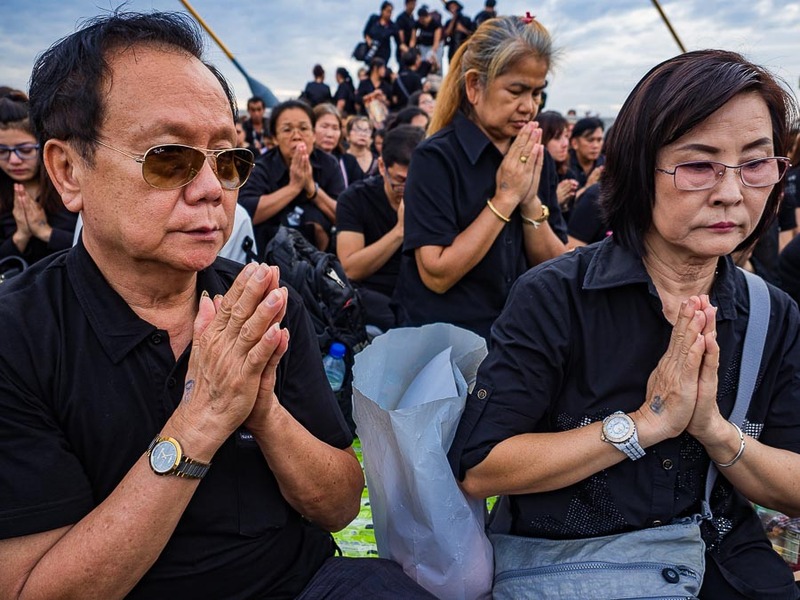 The mourning period will continue until late next year when the King is cremated. 999 Buddhist monks participated in a merit making service on the bridge. 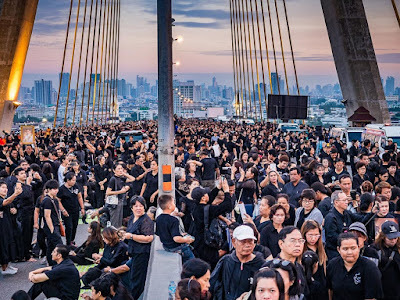 The bridge was jammed with people paying their respects to the memory of His Majesty. The Crown Prince, King's son and heir apparent, His Majesty King Maha Vajiralongkorn Bodindradebayavarangkun ascended to the crown on Friday, Dec. 2. This was not his coronation. It is being described as an ascendency. He will reign as King but his formal coronation won't take place until after his father's cremation. A woman weeps during the ceremony on the bridge. 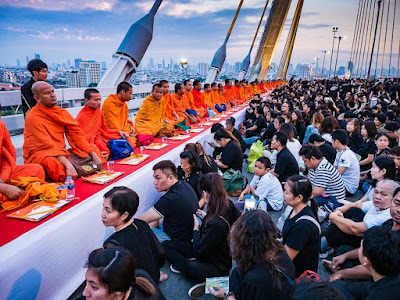 People pray during the ceremony. This is not unusual in Thailand. King Bhumibol Adulyadej, ascended to the throne in 1946. 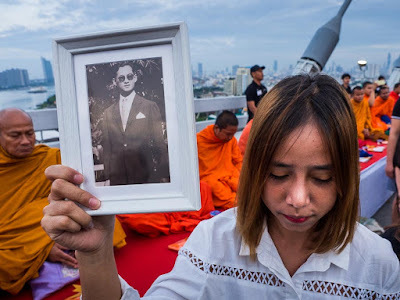 He left Thailand to finish his studies in Europe (Thailand's Chakri Kings have always valued education and most have been educated at Thailand's finest schools and prestigious universities in Europe and the US). His coronation didn't come until 1950, nearly four years after he ascended to the throne.